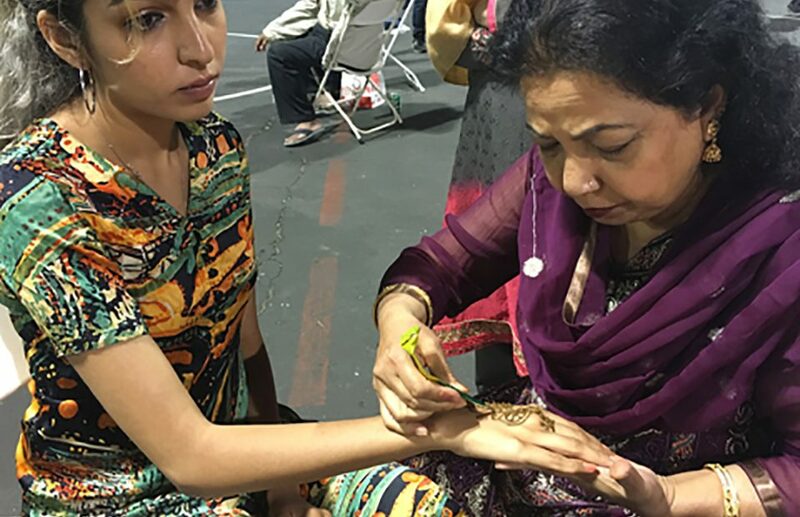 On Chand Raat, I team up with my friend Shaista, and we drive our daughters to Virgil Middle School in Los Angeles’ Little Bangladesh in east Hollywood. Though we arrive after 9:30 pm, the courtyard is packed with a crowd. On one side of the courtyard, snacks and tea are served, while on another, saris and shalwar kurtas are on display for women to purchase. In the center is a stage, and the microphone moves between an announcer, a DJ or a singer. Everyone on the mic—and all around us—speaks Bengali. While Shaista, her daughter and I take a break to sip tea and eat pani-puri, we send Minal on a mission to find mehndi/henna. She returns with information. “There’s a long line, but women are doing mehndi there!” She points to a section of the courtyard where we haven’t ventured as yet. 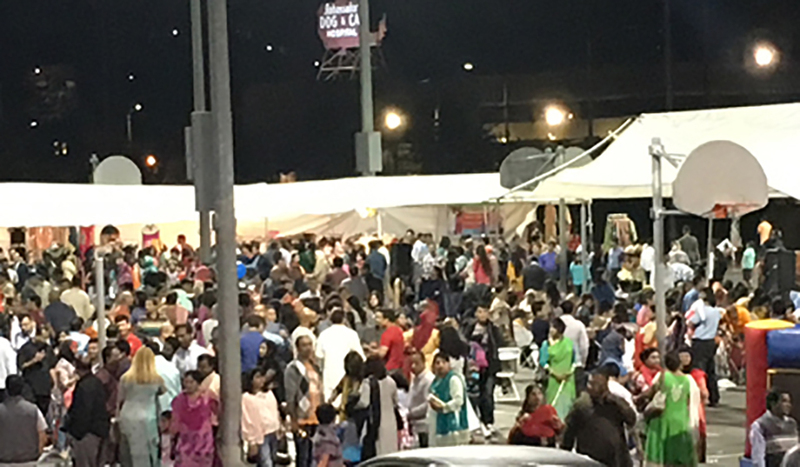 We finish our snack and head toward the mehndi area, but the line is long. Shaista’s daughter sights an enterprising woman sitting on the side, who has set up her own mehndi table. Shaista and I wander off to look at saris, but Minal and Shaista’s daughter wait to talk to the mehndi-woman. 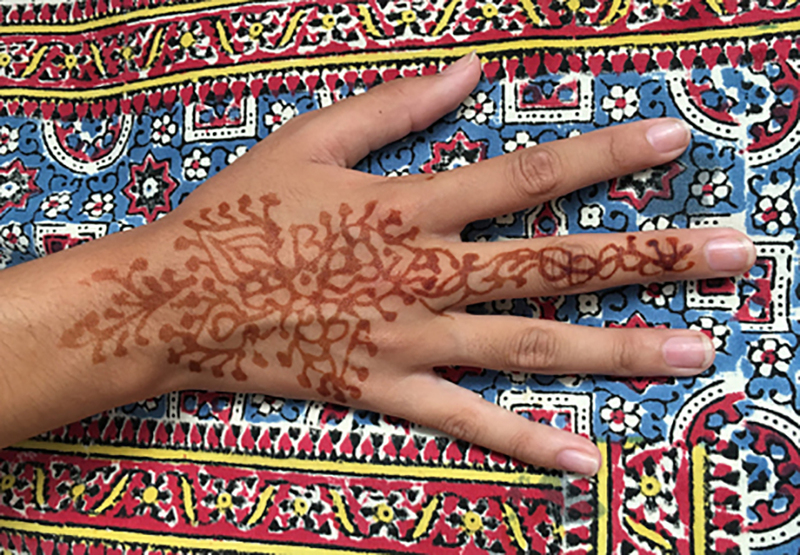 When we return, the girls’ hands are almost done, but because the woman is running low on her mehndi cones, she only decorates the backs of the girls’ hands, and not the palms also. Still, the girls are satisfied, and we walk away as the celebration is about to close.